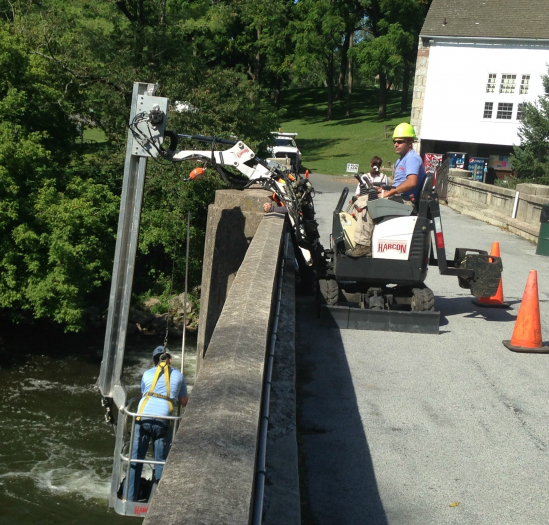 See Our Bridge Trackers in Action! Click Here! 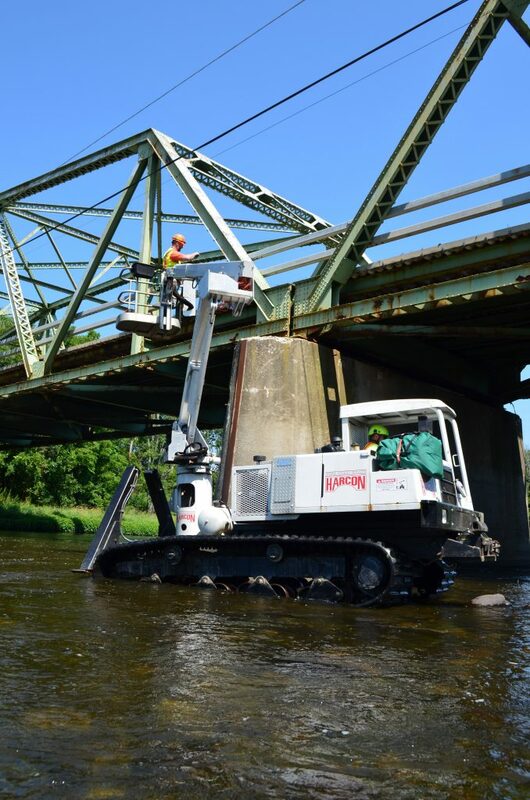 Harcon’s Bridge Trackers are the most aggressive extreme terrain bridge inspection machines in the world. Harcon has three Bridge Trackers: T-63, T-44, T-40 (the numbers correspond to their working heights), and STU, our Sidetracker. They can operate in water depths varying from seven to nine feet. All can climb slopes in excess of 35 degrees, traverse 25 degree slopes, and navigate wet and muddy terrain that would bury most off-road machines. Their rubber tracks eliminate damage to paved areas. Railroad tracks are a piece of cake. 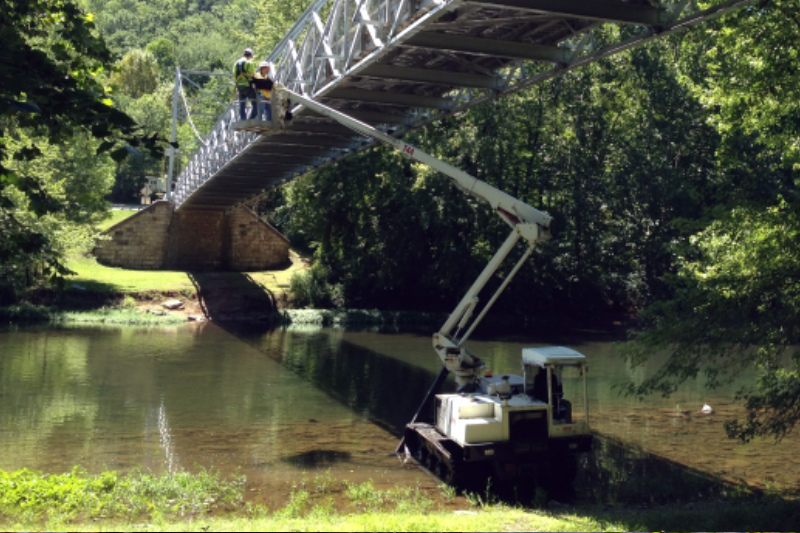 All our Trackers have onboard compressors and pneumatic tools for bridge cleaning. The two smaller units weigh in at approximately 9 tons. The T-63 weighs 20 tons. 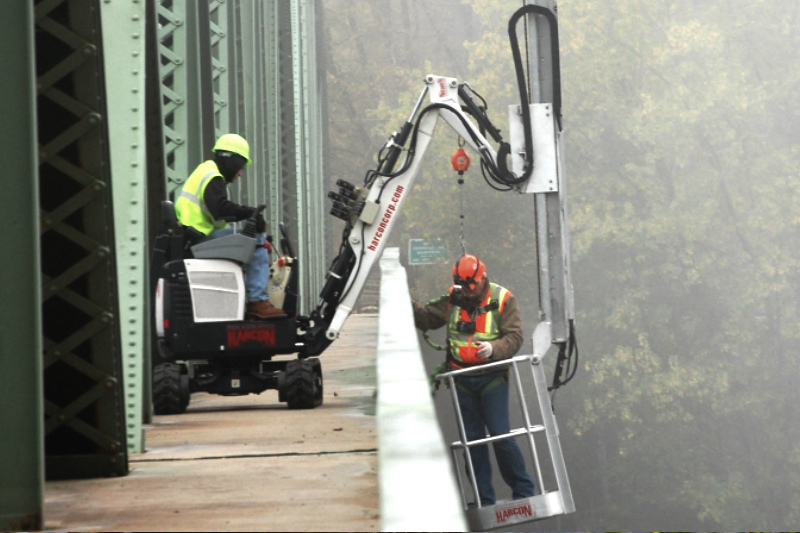 At under 3,000 pounds, our Sidetracker (STU) is the lightest weight motorized under-bridge access machine in existence. We’ve fabricated two boom lengths, one which allows us to reach over an eight foot fence. The Sidetracker is perfect for cantilevered sidewalks. 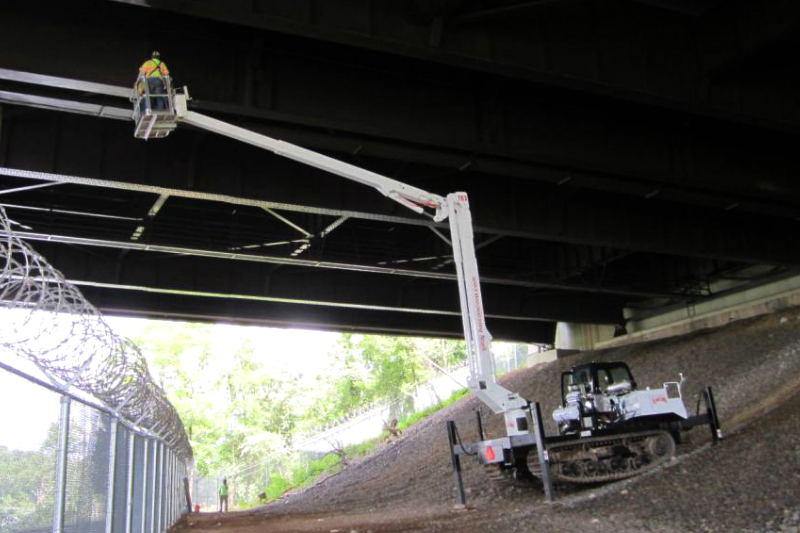 We’ve found it also extremely useful on pedestrian bridges or other load sensitive structures where conventional equipment is simply too heavy. 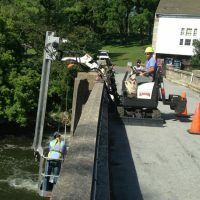 Vertical down-reach varies from five to eight feet from deck level, depending on the boom being used. The Bridge Tracker has been stability tested and certified. We’ve had hydraulic studies done to test the effects of water current at various depths. Few streams are too swift for the Tracker. From the time we reach the worksite, we can usually have the Bridge Tracker unloaded and under the bridge in less than fifteen minutes. 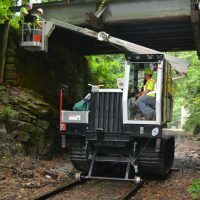 Unless the topography is extremely challenging, repositioning the machine for each “set” takes no time at all. We use non-toxic, non-polluting, synthetic, biodegradable hydraulic oil to eliminate environmental concerns associated with carbon-based oils. 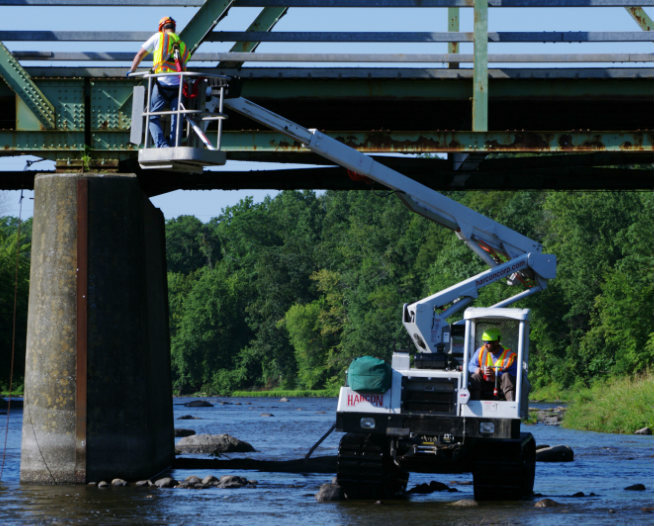 We work closely with local, state, and federal agencies to ensure we’re not violating any environmental regulations or endangering spawning fish or protected species. Unless we’re working in water with special regulations, we are not prohibited from fording most streams during the course of an inspection. 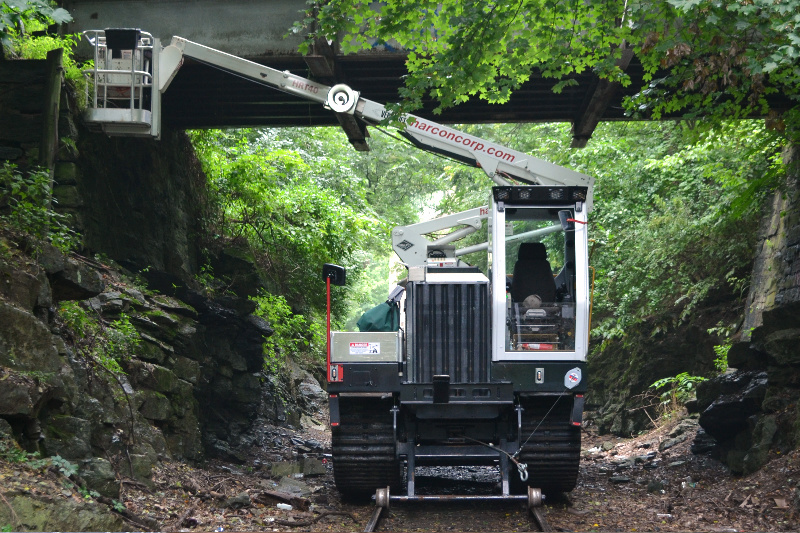 Harcon’s newest Bridge Tracker HRT40–High Rail Tracker 40. It’s a rubber tracked high rail bucket truck with a 40 ft. working height and comes equipped with an on board compressor and generator. Why is there a scissors lift under the cab? 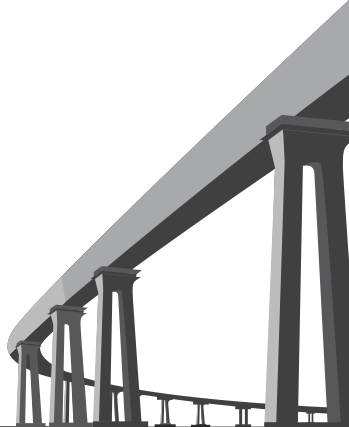 We can work in water depths up to 8 ft. Again, it allows us to access a bridge from underneath, thereby reducing foul time. Rarely. We are sensitive to certain fish spawns and we avoid waterways with special regulations. We also use Mobil EAL 224H, a biodegradable, non-toxic, vegetable-based hydraulic oil in all our machines that enter waterways. Ballast disturbance is minimal. Our Trackers have low ground pressure: under 3.2 psi. That’s less than your footprint. 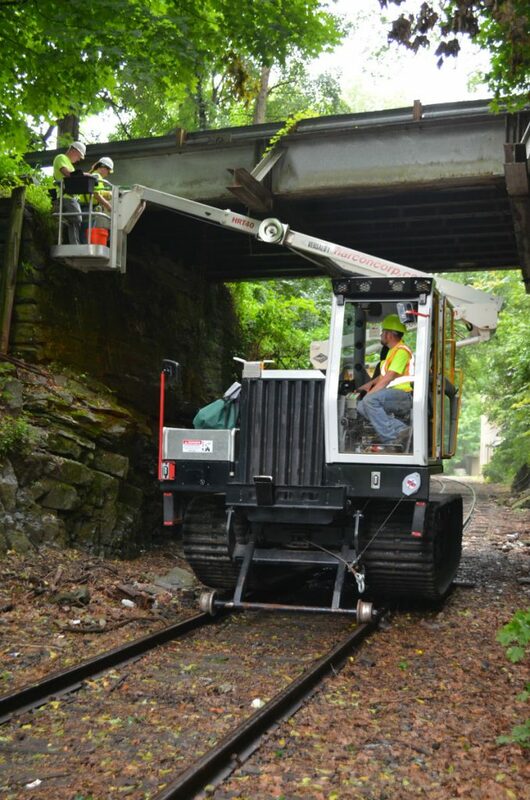 Also, we train our operators to “tread softly”: to turn gradually or not at all on ballast. Finally, in the event we do disturb some ballast, we carry hand tools to “mend” the damage. How do I know your machine is suitable for our structure? Harcon will preview your structure in advance. We’ve worked in 28 states to date, so if you’ve got a structure on which foul time is problematic, don’t hesitate to call us. We are scheduling work beginning July 1, 2015. 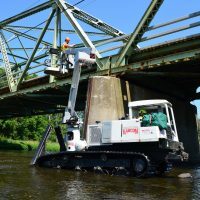 I've had the pleasure to call upon Harcon to provide bridge inspection access solutions for over 25 years....The vision of their new access equipment is revolutionary and allows AECOM to continue to provide our clients with efficient solutions for hands-on access.